I haven’t posted a new Black and White Tuesday photo for a few weeks but after our Sunday afternoon hike around Deception Pass State Park I’ve got plenty of new photos ready to share. In the spring of 1792, Joseph Whidbey, master of HMS Discovery and Captain Vancouver‘s chief navigator proved that it was not really a small bay as charted by the Spaniards (hence the name “Deception”), but a deep and turbulent channel that connects the Strait of Juan de Fuca with the Saratoga Passage, which separates the mainland from what they believed was a peninsula (actually Fidalgo Island and Whidbey Island). Thomas Coupe, a sea captain and founder of Coupeville, was the only man ever to sail a full-rigged ship through the strait discovered by Whidbey. The bridge, one of the scenic wonders of the Pacific Northwest, is actually two spans, one over Canoe Pass to the north, and another over Deception Pass to the south. Construction began in August 1934, and the completed bridge was dedicated at noon on July 31, 1935. The Wallace Bridge and Structural Co. of Seattle, Washington provided 460 tons of steel for the 511-foot Canoe Pass arch and 1130 tons for the 976-foot Deception Pass span. The cost of the New Deal-era construction was $482,000, made possible through the Public Works Administration and county funds. Thanks, Andy I appreciate your feedback! I’m glad you like it, Jim! ooooh…you’ve combined 2 of my favourites here: black & white + architectural subject. Add in those moody skies and this one is a winner for me! Beautiful! I loved seeing all of the bridges when we were in the Seattle/Portland area last week! There are a lot of beautiful bridges around here and I love the variety in Portland. 🙂 I hope you had a great visit! 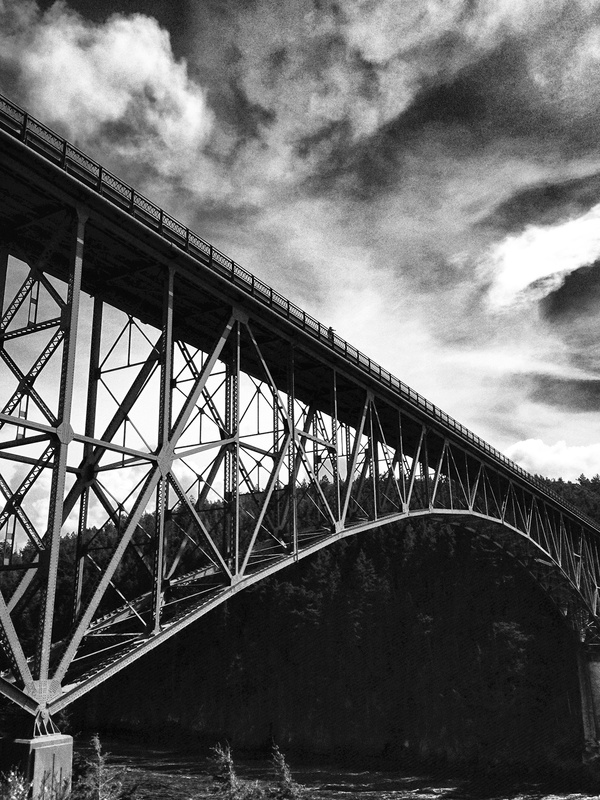 There are so many beautiful bridges in the Pacific Northwest. Most of our steel structure bridges in the S.F. Bay area have been replaced by concrete bridges with no character. The black and white image gives this picture character just like the bridge. Thanks, Patrick. I agree with you about the concrete bridges…they are pretty boring. These old steel ones have so many great angles and are really pieces of art. That is a great shot and that bridge is so spooky in the fog at night. Wonderful composition of this photo. Black and white makes it really stand out. Thanks, Angeline. 🙂 Black and White was a last minute decision and I’m glad I decided to give it a try. If Whidbey, Vancouver and Coupe were alive today I wonder what they’d say. What a moody shot of a great NW icon! Kind of gives me the willies! This is a magnificent shot, Lisa! Thank you for sharing the historical information.